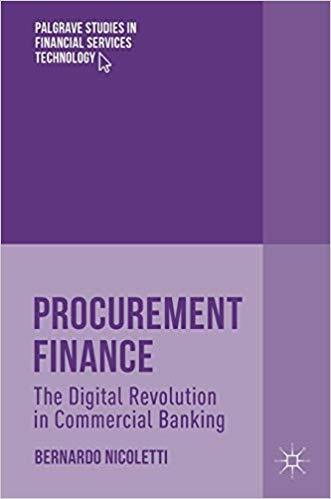 “Procurement Finance: The Digital Revolution in Commercial Banking (Palgrave Studies in Financial Services Technology)” presents a business model on how to structure the relationship between financial services and procurement. The need for new models is particularly important to support small and medium enterprises (SMEs) where there is an evident difficulty in accessing credit. Due to this context, innovative solutions must be introduced. The objective of this book is to determine how innovation can support the dynamic and volatile international context and the increasingly relevant function of procurement. It is becoming more and more important to take into account complex international transactions with notably long payment terms. Organisations need to manage the best way to handle the financial relationships and the risks related to credit provision and payments. This book presents an end-to-end support to procurement, including trade finance, supply chain finance, and related payments. In addition, the enterprises need to keep sufficient liquidity levels in the short and medium term. This is a constant challenge today, with the turbulence of financial markets and a continuing climate of economic uncertainty making it harder to obtain external funding. Businesses need to optimise the working capital. This can be done through the innovative concept of procurement finance, which allows SMEs to benefit by the new vision of collaborative procurement. This book provides several practical examples of advanced procurement finance solutions. It demonstrates how the use of process improvement and technology can help in overcoming the current financially difficult situation. In addition, based on the business model presented, the integrated approach to procurement finance allows sustainable solutions which will be of interest to academics, researchers, managers, and practitioners in both buyer and vendor companies, as well as in banks and other financial institutions.